This week has been long with my little monkey who can't stay asleep for naps after noon. She gets so overtired and fussy and I get irritable and am now completely spent. I'm very much looking forward to the weekend! Especially since Sunday is Mothers Day. I'm hoping for an hour long bubble bath. 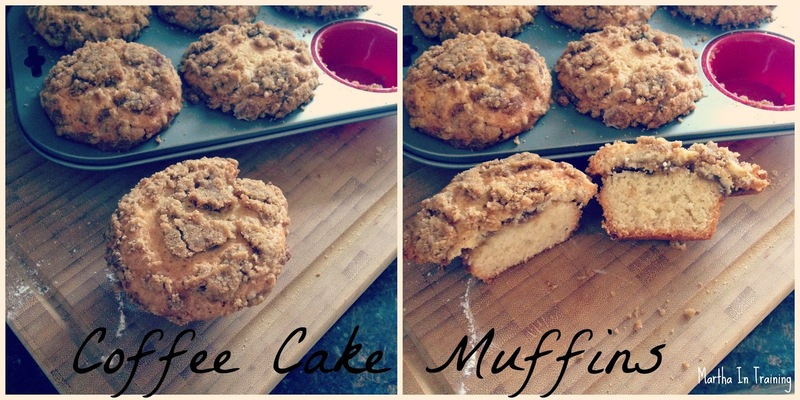 Here's a recipe for some delicious coffee cake muffins you could make for your mom! This recipe is pretty much word for word the recipe on the Martha Stewart site, only I substituted raspberry yogurt (full fat. It's tastier) for sour cream (which I didn't have). Preheat oven to 35o degrees. Prepare streusel topping: In a medium bowl, stir together 1 cup brown sugar, 1/2 tsp cinnamon, 1 cup flour, and 1/2 tsp salt. With a pastry blender or two knives, cut in 1/2 cup (1 stick) chilled butter, cut into small pieces until mixture resembles large coarse crumbs; refrigerate until ready to use. Butter and flour a jumbo 12-cup muffin tin (or two 6-cup muffin tins). I used a silicon pan which made removing the muffins without only taking out the tops SO easy. In a small bowl, whisk together 1 3/4 cup flour, 2 tsp baking powder, and 1 tsp baking soda. Using an electric mixer on medium speed, beat together 1/2 cup butter, 1 cup yogurt (I used raspberry), 1 cup granulated sugar, and 1 tsp vanilla until light and fluffy. Beat in 2 eggs, one at a time, until well combined. With mixer on low, beat flour mixture into butter mixture. Divide half the batter among prepared muffin cups. Top with half the streusel mixture, then remaining batter, and top with streusel. Bake 25 to 30 minutes or until a toothpick inserted in center of a muffin comes out clean. Cool in pan 5 minutes, then transfer to a wire rack to cool completely. Dust with confectioners' sugar, if desired.